I had a precious little ball of pink sparkly yarn that I thought might be enough for a baby hat…but not quite. I was in a bit of denial- I cast-on and started knitting, thinking that lace would stretch it out and I would get most of it done… yeah. No. Rip out and start over, with a bit more pre-planning. Anyway, I had a golf-ball sized chunk of it left, and a great-niece on the way, and I thought, what better use for this perfect little… shoot, not enough. I wasn’t in complete denial, as I went along I considered ways of making it work. Maybe making it deliberately little- just a beanie? Nah. Maybe a rapid flat-topped decrease on top, like a pillbox. Nah. Then I thought about it backwards and inside out- what if we considered the pink lacy part to be a cuff, to folded up over a white background? that way the lace would be more defined, and there would be some adjustability in the ear coverage. My favorite lace pattern is Old Shale, also called feather and fan. It is easy to memorize, and makes the cast-on edge scalloped and ruffly. I originally got the pattern from The Twisted Sister Sock Workbook (not affiliated with Dee Snyder), but it is a traditional pattern- no one really owns it. 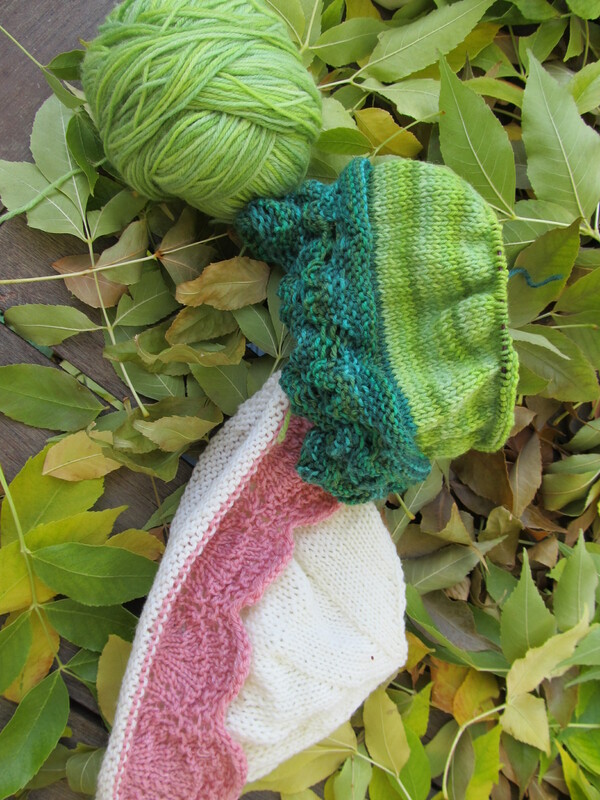 This pattern is adjustable, either by using bigger needles and thicker yarn (perhaps for a big sister?) 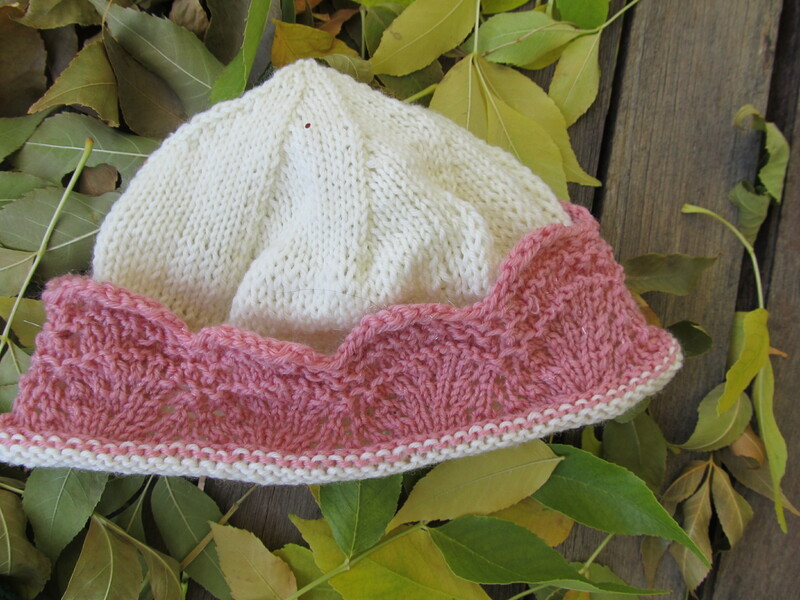 or by adding repeats to the old shale pattern- each repeat is 11 stitches, which makes about 1 and 1/4 inches in the circumference of the hat. Some people test really well on being able to visualize and rotate shapes inside their minds, seeing how puzzle pieces go together, spinning parts around in three dimensions. At least one of my brothers is gifted at this. I am not. I had to concentrate really hard to figure out how the heck I would turn this around so that the pretty side of the lace would show through the holes in the lace of the folded up cuff part, but I wouldn’t have to construct the entire hat backwards…. I am sure the mental exercise was good for me. Then I was sitting next to the hillbilly goldfish pond, enjoying the sunshine, and had a thought. What if I just turned it inside out, and knit in the other direction? Yeah. That works. There is kind of a hole from going the other way, but since I changed colors there, the hole can get filled in with the woven-in ends. Gauge is not super important here- baby heads come in a wide range of sizes- this is for a baby due in December/January. I would make it bigger for babies born at different times of the year… with my gauge, using this yarn and these needles the hat is 16 inches around. Your mileage may vary. Old shale lace pattern- cast on a multiple of 11, join round, being careful not to twist. Cast on 99 stitches in pink and work old shale pattern as written for 3 repeats. (Making the third row perl makes it so the edge does not roll.) Then continue without perling the 3rd row until the piece measures 3 inches from cast on edge- which will be scalloped. Or, if you have a tiny amount of contrast yarn, go until you run out of yarn, as I did. Switch to white yarn. Turn the piece inside out, so that the wrong side faces you. You will have to go backwards over what you have knit. There will be a slight gap, but you have to weave in the ends if you change colors, so the gap will be filled. 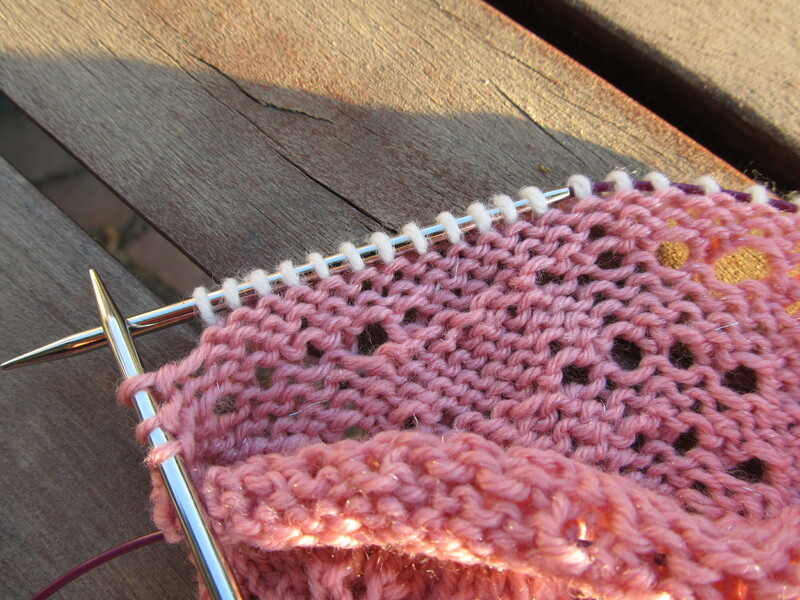 In the next row, knit two together 3x spaced evenly, 96 stitches so that you decrease to 96. Knit stockinette 4 inches, and begin decreases. Place markers every 12 stitches-* knit to 2 stitches before marker*, and knit two together, 1 row plain*. You will hit a point when your circular needle is too long, either add another circular, or switch to double pointed needles. Repeat these two decrease rows until 8 stitches remain- break yarn and sew end through all remaining stitches, then weave in ends. Wash in wool wash and block.